CANTON, Mass. (July 1, 2013) – Dunkin’ Donuts is kicking off July with summer menu items to help keep people running both hot and cold. Leading off, Dunkin’ Donuts is bringing the heat to its lineup of breakfast sandwiches, introducing the new Hot & Spicy Breakfast Sandwich and Hot & Spicy Wake-Up Wrap. 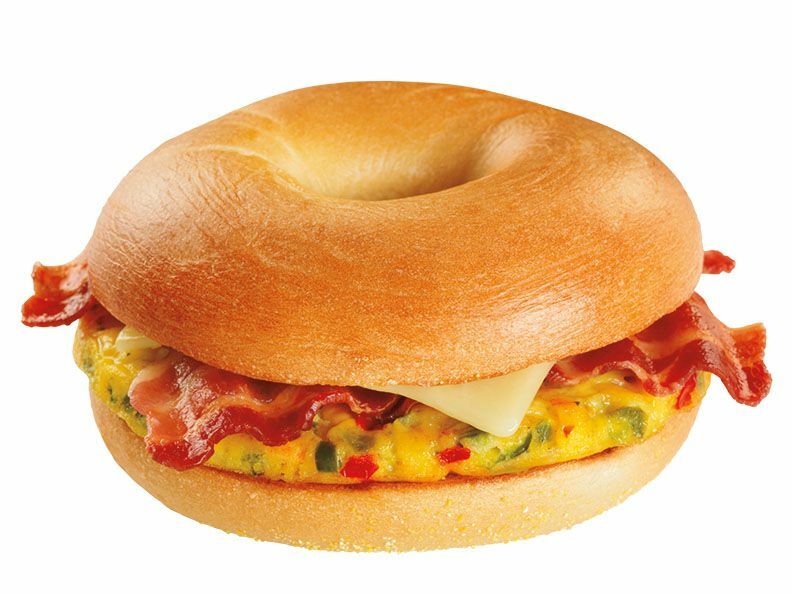 The Hot & Spicy Breakfast Sandwich includes a spicy omelet featuring jalapeno peppers, red bell peppers and pepper jack cheese with habanero, served with two slices of bacon and a slice of white cheddar cheese on a plain bagel. The Hot & Spicy Wake-Up Wrap includes one-half of the spicy omelet, served with one slice of bacon and a slice of white cheddar cheese on a flour tortilla. Both are available through August at participating Dunkin’ Donuts restaurants nationwide. To help guests keep it cool, Dunkin’ Donuts also offers a Raspberry Lime Coolatta® frozen beverage. Featuring a sweet lime flavor with a hint of raspberry, the Raspberry Lime Coolatta is available for a limited time at participating Dunkin’ Donuts restaurants nationwide. Dunkin’ Donuts offers several varieties of Coolattas to beat the heat this summer, including new Berry Blast, featuring a burst of pomegranate and blueberry taste; Hot Chocolate Coolatta, a refreshing frozen treat with rich, milk chocolate flavors that lets you love Hot Chocolate in a new, unexpectedly ‘cool’ way; and Minute Maid® Orange Coolatta, a favorite orange flavor in a refreshing frozen drink. For a great Independence Day gift to help friends and family have a cool holiday and keep running all summer long, Dunkin’ Donuts has introduced virtual Dunkin’ Donuts Cards featuring fun and festive July 4th themed designs. Virtual Dunkin’ Donuts Cards can be sent via email, text or Facebook through the mGift feature on the Dunkin’ Donuts mobile app, available for both iPhone and Android smartphones. With the mGift feature, users can send a variety of virtual Dunkin' Donuts Cards, which can be redeemed directly from a mobile phone at any of the more than 6,000 participating U.S. Dunkin' Donuts locations. All Dunkin' Donuts mGifts can also be added directly to the Dunkin' App, reloaded right from the phone, and used as a fast, convenient way to pay.